Rarely have I been so excited about a recipe, but this one is just plain out of this friggin world. Trust me guys, when I say “Knock–You-Right-Off-Your-Feet”, I really mean “Knock-You-Right-Off-Your-Feet”. These Sweet Potato Brownies seriously threw me straight to the ground with every single bite I took . I still don’t know how I even managed to not eat the entire pan right then and there, after I took the first bite. In fact, I don’t even know how it is that I was able to only eat 3 squares out of the whole pan. And that’s over the course of a week, too! The rest got either given away or sent to the freezer. I really hope that they freeze well and that I haven’t just wasted half the batch by throwing them in there, ‘cuz that would be a hell of a shame. I mean, these guys are absolutely perfect in every possible way. At least, as far as I’m concerned. 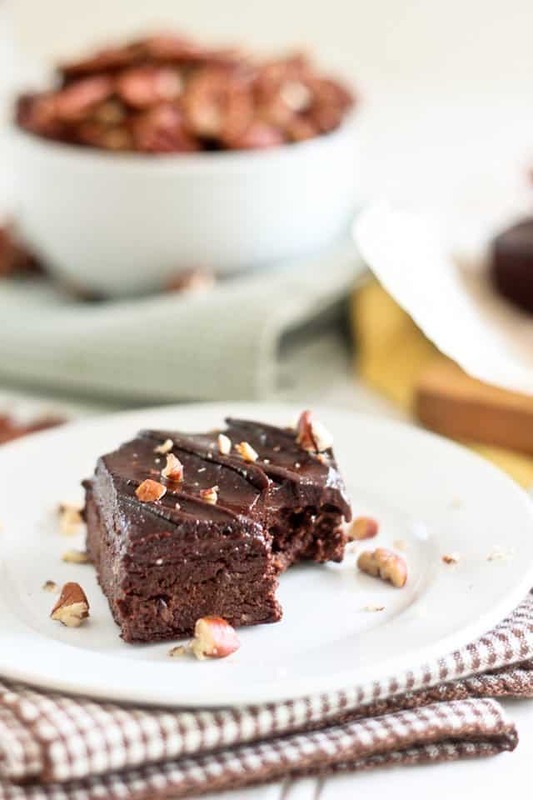 They simply have everything I like in a brownie: an INTENSE, dark, super chocolate-y flavor followed by a nice, subtle touch of sweetness, a crazy dense but super moist and chewy texture, all that topped with a dreamy creamy and decadently smooth, melt-in-your-mouth frosting. Honestly, this recipe is FAR superior to my previous, non-paleo version, in every possible way. It doesn’t even compare. I know that back then, I said that those brownies were really great, but I wouldn’t even consider making them again now that I’ve tasted these. They do have SOME similarities, though. Just like the previous version, these do get better, tastier and richer after a couple of days sitting in the fridge and are to be enjoyed cold. Mind you, I haven’t tried them warm, but I can’t really imagine them being good. I think they truly are at their best when they are completely chilled. However, they are super delicious and ready to eat after having spent only a few hours in the fridge. It does taste as good as it looks, maybe even more. Bottom line, this is now my official go-to brownie recipe. Now, all I need to do is work on different versions of this. Spicy Pumpkin Cinnamon Swirl or Almond Joy Madness, perhaps? Oh, I know… Salted Caramel and Crispy Bacon! Did I ever tell you guys just how much I enjoy baking? Place ONE brownie on your plate. Eating starts with your eyes, doesn’t it? Alright, go on, grab a bite! Now that’s a texture I like! These sound delicious! I’m intrigued by the ingredients too – must try when I next have a baking weekend! Baking weekend.. That sounds like fun! I think I need to have some of those, too! Hope this recipe doesn’t disappoint, Rachel. Please, share your thoughts if you ever try it! These look so good! I think I might as well run to my kitchen and make some for myslef! Thanks for sharing this. Thanks! Hope you like ’em as much as I did, Anne! I can’t wait until I have the pleasure to make these! They look fantastic! Can I make these without arrowroot or maybe replace it? Yes. Arrowroot, I was amused to notice, said on the side of the package for its ingredients only one word: tapioca. So it must be just another word for tapioca starch. I had it but didn’t want to open it. So I used potato starch instead. It tends to work as well in recipes with less of the slimy thing you can get from tapioca starch. And it was fine. DO NOT EAT THEM STRAIGHT FROM THE OVEN! I’m impatient. It said not to. I did anyway. Yuck! Eggy!! But, after overnight in the fridge (like it said to do), they’re quite good. We recently had someone join our workplace who needs to eat gluten free. I am the unofficial ‘bringer of treats’ for the office and want to make the next thing I bring in safe for her to eat. Are these gluten free? They appear to be to me but I also know that gluten can ‘hide’ in ingredients. I don’t want to make her sick! Thanks. Once you start using date paste, Kylie, you’ll wonder how you ever were able to live without it… it’s one of those things that I ALWAYS have in the fridge now! I’m definitely going to give these a try next time I bake! I think that I’ll try to use Tapioca flour/starch in place of the arrowroot, since that’s what I already have and is used for the same purpose. Is the date paste just used as a sweetener? Also, do you think I could do without the chile? As for the tapioca flour, it should do the trick alright! How many servings is this recipe based on? I know it says 91 grams, but is that when it is cut into 9 pieces? 12? That information is mentioned at the very top of the recipe, Zosia. 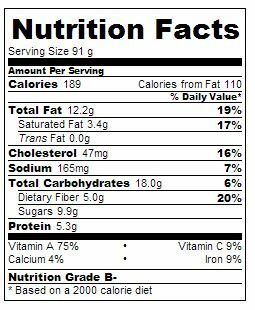 The Nutrition Facts are based on 1 of 16 brownies. I am so glad I found these. I am gluten and sugar free and these look perfect. Thank you for sharing this. And the photgraphy is just so artistic. Thank you so much Monica, and hope the brownies are to your liking! Make sure you let me know if you end up trying them! I live in Florida where we eat big green smooth-skinned avocados as often or more than the wrinkled-skin Mexican avocados. You got me at your ingredients Sonia. Its different from the traditional brownies. Look so delish and creamy. I love it! What a good idea!!!! Congratulations!!! I’m going to try this new brownie recipe!!! I made this and loved it so much that I posted it on my website. You said to let you know, so here is the link. I used pumpkin instead of sweet potato. I also linked to you. Thank you so much. Um do you need to use the ancho chile? Absolutely not! You can totally leave it out if you don’t care for it. I am 100% going to make these! How Awesome! Hope you 100% like ’em, Laura! 😉 Make sure you let me know! These look really good! Do you have any suggestions on replacements for the eggs and honey to make them vegan friendly? Not sure, Becki, as I’ve never used egg replacement myself, but apparently people get great result with “flax eggs”, which consists of flax seed meal mixed with water. As for the the honey, you could very well use dark (grade B) maple syrup instead. Good luck with that, and let me know how things went if you give them a try! Well, I made the brownies, and I would say that they are less than delicious. The texture is weird and they were ok, but certainly not good. Maybe you need to be on the Paleo diet (which we are not) to appreciate them. I can’t recommend them, sorry! Substitute for eggs besides flax is hydrated chia seeds. I believe its 2:1 or 3:1 water to chia seeds so 1tbsp chia for three tbsp water or something like that. Chia seeds are super fantastic like flax but better. I am just getting into paleo and I love the idea of so much finer and nutrition in something remotely close to a brownie. I will make these as soon as I get some dates next week. My husband loves chocolate anything so regardless of texture, I’m sure he’ll eat them …and he ‘ll be eating to his health too! Wow, that recipe looks so sweeet!!!!!! I’d say preparation, more than dedication, Beu. 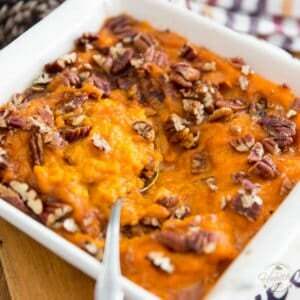 The trick is to bake the sweet potatoes in advance, and make a few extras while you’re at it. Then you can use them in all sorts of different dishes, throw them on the grill or pan fry them quick quick for a great side… I normally will bake 2 or 3 sweet potatoes and 1 or 2 squashes during the week-end so that I have them ready and on hand for the rest of the week. THESE ARE AMAZING!!!!!! I have been trying to make healthy chocolate treats for a while now and have always been disappointed by the taste after spending so much effort making them. NOT WITH THESE!! I am addicted and will definitely be trying other recipes on your site. Have recommended to so many people now 😀 Thank you thank you thank you!!! Thank you for this recipe, it is ridiculously good!!! I subbed a little: tapioca instead of arrowroot and almond butter instead of hazelnut. But only because it was what I had in the cupboard. The frosting is to die for and I reckon the hazelnut butter would make it even better! (if that’s possible). I tried them hot and frosted (couldn’t resist!) and they’re so gooey and cakey and delicious. They’re currently in the fridge and I’m impatiently waiting for them to cool. For anyone debating whether or not to make them, or questioning the ingredients, or thinking it looks fiddly… it’s not, don’t question, just DO IT! Even my non-paleo family members are going to love this. I can’t rave enough. YUM!!! Made these brownies & they were to die for, so yummy. Even non-healthy people ate them & declared them delicious !!! These were fantastic! I made them last night and could not wait to dig into them this morning. Yes, I totally ate a brownie for breakfast 🙂 No regrets! Thanks for a great recipe. I will definitely be making these again. How could I miss this, Kaelee?! Thank you so much for your great feedback. real glad to hear you liked the brownies. AND that you had them for breakfast, too! Nothing wrong with a little breakfast treat, from time to time. I can’t seem to find date paste anywhere here in the Philippines! What can you suggest as a substitute for this? I’ve been wanting to make this recipe for quite a while already! How did these end up freezing? Would you believe me if I told you they’re still sitting comfortably in the freezer? I had sort of forgotten about them… I might try one this week-end, now that you reminded me that they’re there! OMG, I just tried one and they’re even better than I remembered! After over 3 months in the freezer, I just thawed them in the fridge overnight and they’re as good as fresh, if not better, really! OMG! These are delicious! Absolutely just as you described them to be! Even my 6-year old who is VERY picky ate it (however she did ask me to use more cocoa and less – noticeable – nuts next time;-) I’m beyond ecstatic! When SHE likes a dessert (and she LOVES sweets! I have tried for “ages” to find a paleo recipe that I could get her to eat and finally here we go!) THANK YOU!!! This thing is incredible! 🙂 I used coconut oil instead of avocado and almond meal+coconut flour instead of coconut flour+arrowroot flour.. and different icing ( not paleo but high in protein) and it is so delicious <3! I can't wait for breakfast :)! I´m really keen to try these, but I live in Portugal and avocados are very hard to find here, and ridiculously expensive when you do… is there anything I can substitute them for? More sweet potato or apple sauce, maybe? Same story with coconut and arrowroot flour… neither of which are available here… I was thinking os using oat flour or almond meal, or a mix of the 2… would it work? Wow, that’s a lot of substitutions… To be honest, have absolutely no idea how this would turn out. I’ve never worked with oat flour, so I really wouldn’t know how much to use. 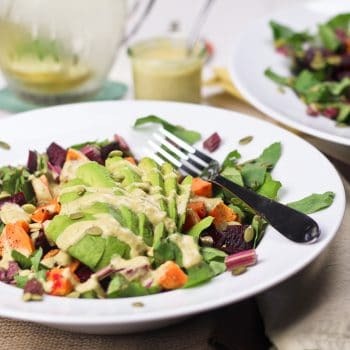 As for the avocado, I would probably use a mixture of whipped coconut milk and coconut oil to replace it. Not sure how much, though. Probably something like a half cup total, so maybe ¼ cup of each? The arrowroot you can use tapioca flour instead, or even cornstarch if you use that. Sorry I can’t be of more help… hope these turn out for you if you do decide to give them a go! This recipe looks great! I am not sure where to get date paste, but I will make it if I have to! And, Where pray tell, did you get that amazing Nutritional facts information!?!? I have been trying to make better treats for my kids…I’m pretty sure that these fit the bill. Is there anything I can use instead of the apple sauce? Or can you tell me how many apples I need to make the sauce needed for this recipe? You don’t really need to make the applesauce from scratch, Sandra. You can very well use store bought, so long as it’s entirely natural and unsweetened. Really looking forward to tasting it!!! Thanks again! I think I can manage now… I’ll let you know when I need your help. You have a great website and I think it’s great you’re responding to everyone personaly. Good job! Well… It was a lot of work, but it was a success! My little nephew (4 years old) said it tasted ‘a bit funny’, but when I said I could understand, the others didn’t understand why. They couldn’t believe I made it without sugar or flour! 🙂 Thanks again. How did they do after frozen? I am making treats for vacation and freezing a lot, so I want to make sure that they will still be good. I will prolly make them either way, just want to know if I can freeze some or not. Thanks! Good to know, thanks! I am totally excited to try them! I just made these. I have not cooled them yet, but I tried a taste just to see, and they aren’t sweet. They do not have the icing on yet, but did I do something wrong? Nevermind! They taste very sweet with icing. Thanks. Just out of interest, did prehistoric man succeed in gathering salt from the himalayas, making a paste from dates, heading to the far east for chilli’s, dashing across to south america to get hold of cocoa powder (presumably they had the tools to do that), buying baking powder (did they have shops in those days? ), and access to a rangemaster oven? Thought not. Also, wasnt the life expectancy of these sacred ancestors about 20? Thought so, and no surprise he did if he had to travel so far for his ingredients. The recipe looks great, and the health aspects too, I might add, but the context seems to me highly questionable. Can you suggest a substitute for the coconut flour? My son is allergic to tree nuts, including coconut. So sad, I love it, but can’t use it. Thanks! It’s hard to say without having actually tested it, but I think I would try upping the arrowroot powder to 1/4 cup and use 2/3 cup almond flour instead of the coconut flour. I think it should do the trick. Let me know how it turns out if you do end up giving it a try! I have two friends, one on a gluten-free diet & one on paleo, both for medical reasons. They always have to skip the desserts at our church home group & I hope to make these brownies for them soon. I’m hoping they’ll become a hit with the whole group! I was wondering if the pecans a necessary ingredient? I’m not to sure about nut allergies in our group & I myself don’t prefer nuts in desserts. However, if for any reason they help the consistency in a big way, I will keep them. Thanks for the great recipe! I need to double this recipe. Any problems with that while baking? I don’t think it would be a problem, so long as you use a pan that’s twice as big. And you might have to add a couple of minutes to your total baking time, also. Five, maybe? Just to be on the safe side. 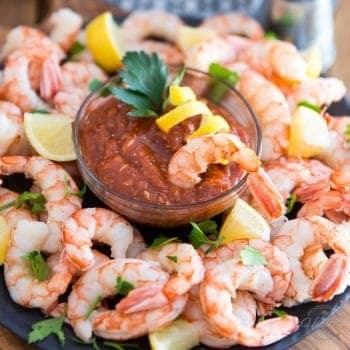 Could i use a pinch of paprika instead of the ancho chile? So… I made these this morning and I tried them this eve(maybe not enough time? )but they taste like chocolate avocado? Is it possible that I had too much avocado and there was an imbalance with the sweet potato? The frosting is awesome and the texture I love, but the flavor is … Odd. Distinctly not yummy brownie and I think it must be something I did… Any thoughts? Did you let them cool completely before tasting them, Bridgette? I must have done something wrong. These were not a hit at all with me or my family. The frosting was amazing, but the texture of the brownie was like pudding. It wasn’t cake – like at all. I followed the directions word for word and didn’t take a bite for 24 hours. They left a strange residual taste in everyone’s mouth. So disappointed. 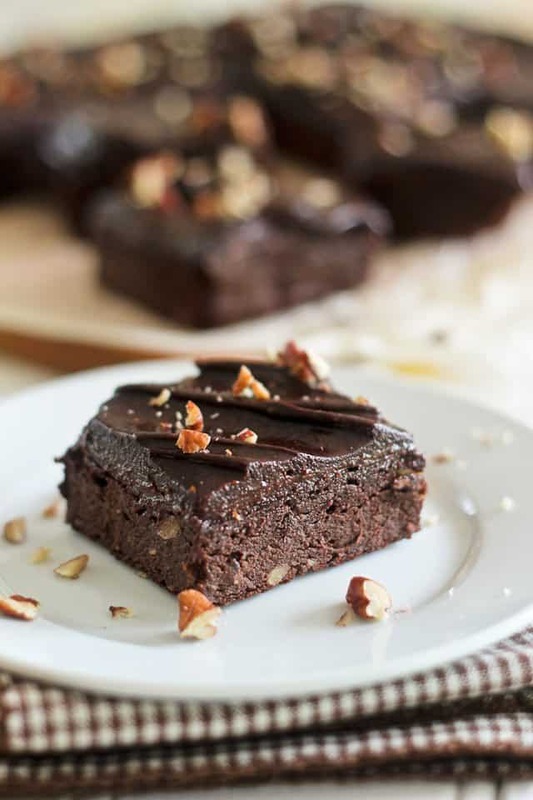 I plan on making these for dinner party only don’t have hazelnuts, can I substitute any of the following: cashew butter, almond butter, coconut butter or cacao bliss chocolate butter? Thanks! I would definitely go with the almond butter, Karen! I came across this website a month ago and I have alreadyade these delish treats 3 times!! I used extra coconut flour instead of arrowroot, left out the chile and used almond butter in the icing because that’s what I had. I love love love this recipie! I cannot rave enough! My sister in low loved them, my mom loved them, my roommate loved them, 3 friends at the gym couldn’t get enough, even my picky 10 year old nephew was mine the wiser that these were even healthy!!!! I’ve made key lime pie, banana bread, strawberry cake and various others but this is still my fav!!! Perfect for when you gotta have a chocolate fix, plus the icing makes great dip for strawberries!!! Thank you for this creation!!!! Haha! Yes! You deserve it. I feel like I should frame your recipie! Not my comment though! To many grammatical errors lol 🙂 keep on doing what you’re doing!! These sound awesome. I just made some date paste and was browsing recipes to use it in. Do you think the frosting would be ok without the honey? Could I substitute date paste for the honey, or just omit the honey altogether? Made them last night and just had a square…success! My two year old loved them too. I think the guy above that mentioned it was like a pudding must have used an 8 inch pan like I did. Had to bake about twenty minutes longer, but the toothpick doesn’t lie. Neither does simply pressing down on it with your hand. They turned out terrific. Very sweet. We love them. 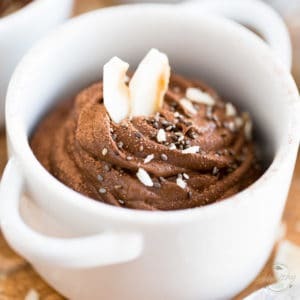 Can I use regular cocoa powder for this recipe? What do you mean regular, Jessica? Just unsweetened cocoa powder. Your recipe said cacao powder so I was wondering if there was a difference between cocoa powder and cacao. They are one and the same, Jessica! Is it possible to sub the coconut flour for any other flour? It’s crazzzy expensive where I live. Thanks! I made the previous version of these before and I thought they were amazing, so I’m really looking forward to these! Thanks I’ll give it a shot! PS I am not saying that they are not good – I am on a mission to change the inaccurate name of the “paleo” diet! Sounds like quite the mission you’re on, there, Paola. Good luck with that! I made these last night, and everyone enjoyed them this morning. They’re relatively light, probably the lack of butter and sugar. And since I’m not a great baker, I agree that they’re a pretty forgiving recipe. Thanks! I think we might be sweet potato soul mates! I have a constant supply of sweet potato purée in my fridge for baking emergencies…the emergency being that I don’t have any brownie to eat! 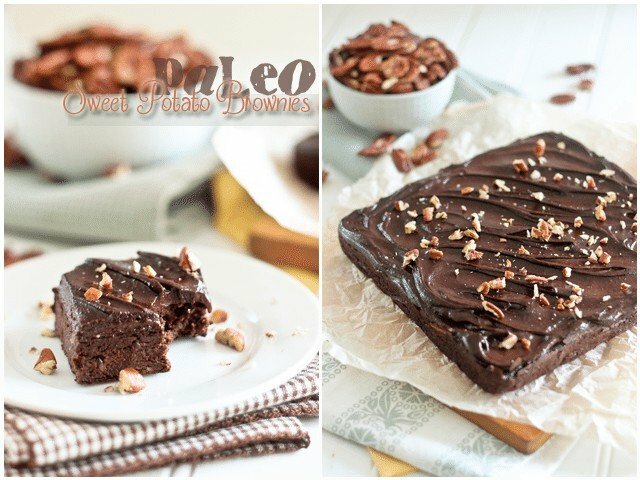 I am new to Paleo and everything I read when it comes to sweets is using coconut items. I can’t stand the flavor of coconut. When you use the flour or the milk does everything you bake taste like coconut? Personally, I don’t find, but I happen to adore coconut so it’s not a taste that would put me off. Perhaps that someone who really can’t stand it would be more apt to detect it since they might find it disturbing. There’s nothing like trying! Made these tonight. So. Freakin. Tasty. The texture was different than I expected, more mousse like than brownie – it’s POSSIBLE I over processed the batter. 😉 but seriously, what a great – and healthy – way to get my chocolate fix! Right?!? My son said they were “fluffy.” He loved them. I had a thought… back in the day I used to get these brownie bites from Costco that my kids just LOVED. 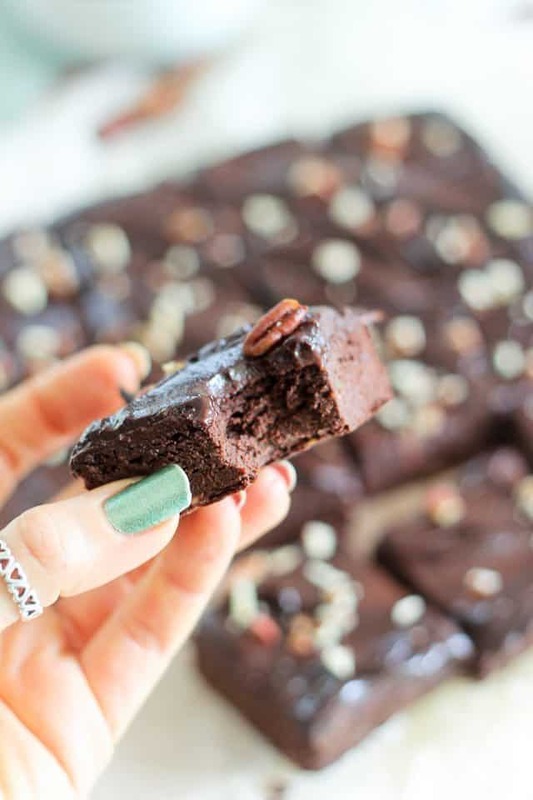 I wonder… Paleo Brownie Mousse Bites…? Use mini muffin tins to make them… Only thing I’m not sure of is how long to bake them. BUT, I think that would be awesome and I think that’s totally going to happen. BTW, people need to stop hating on you. Mama bear coming out. If cavemen had tasted these, they absolutely would have gone out and procured the ingredients. Just sayin. Just looked at them and I’m drooling…. and I think I love you. Not in a creepy-virtual-stalker kind of way (though maybe a little) but in more of a where-have-you-been-all-my-life-I-love-your-culinary-brilliance kind of way. I recently found your website and am LOVING it! I have made several of your nut butters and date paste already. Delicious! 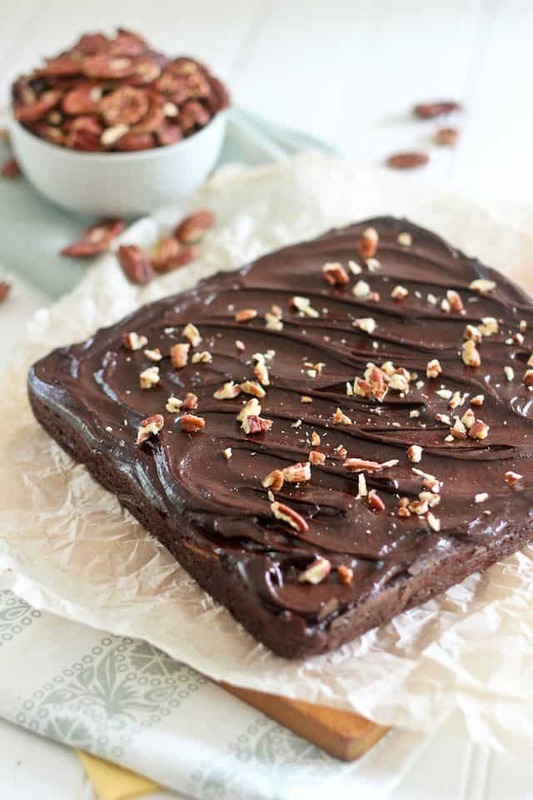 I want to make these brownies for a road trip we are going on in a couple weeks. Do you think I could make them now then put them in the freezer till we leave? Or do you think they would not freeze well? They do freeze wonderfully well, Laura. In fact, I think they’re even better after they have been frozen and thawed! Glad to hear they taste better after frozen /thawed. 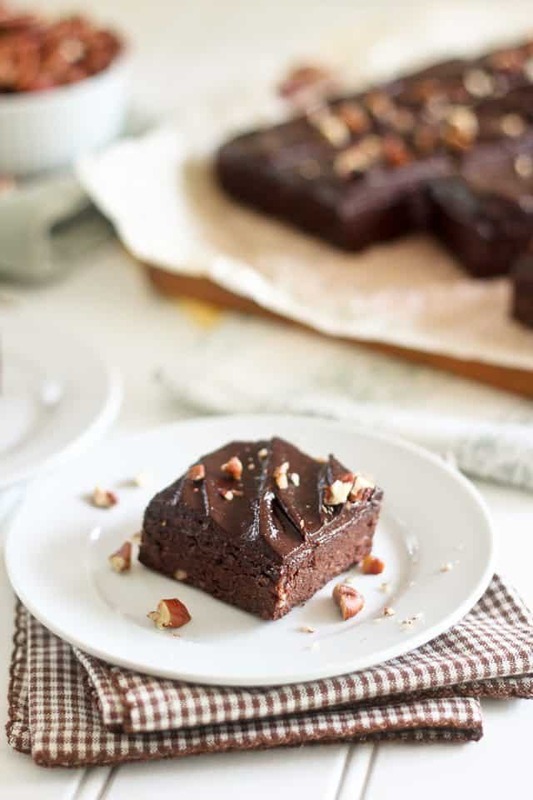 These brownies are so rich and moist and the icing just makes the brownie! Thank you very much. I just started paleo for health reasons. I love sweetS and breads and pastas. I think the paleo sweets have a palate adjustment, but knowing how much healthier they are I am adjusting well. May I ask how you packaged the brownies to freeze best? What I do is I lay them out on a baking sheet lined with parchment paper and throw them in the freezer just like that, uncovered, until they are frozen solid. Then, I put them in freezer bags and throw them back in the freezer. That way, I can thaw as many or as little as I want: when craving strikes, I just take the desired amount out of the freezer bag and transfer them to the fridge, and put the other ones back in the freezer. Glad to hear you liked the brownies, by the way. Yes, healthy treats demand some palate adjustment, but once you get used to them, you’ll actually prefer them to the real thing. You’ll probably find that the “standard” stuff is pretty much tasteless, lacks depth and is way too sugary. So sorry to hear, Lara. What kind of cacao did you use, if I may ask? Hey there Sonia. Will this recipe work without using the nuts? We have a nut allergy in the house. Can Sunbutter replace the hazelnut butter in the frosting or would that alter the taste too much? And real glad to hear you are liking some of my recipes you’ve tried so far, but that also worries me a bit… does this mean that you also tried some that you didn’t like? If that’s the case, I’d really love to know which! Phew, I’m relieved to hear that. I have to give it to you, I do like my chocolate DARK! And I totally agree that fruit juice is an amazing sweetener. I should use it more often. Mental note taken! You were right Sonia! They are totally delicious! I had to leave out all nuts out of this because of our nut allergy. So I ended up using a coconut milk chocolate frosting recipe I found instead of your frosting recipe. But I could still taste the brownie and it’s so tasty! Sure! It’s so easy! You refrigerate a can of coconut milk. Then when you’re ready to make your frosting, you only use the fat from the coconut milk, melt it together with a bag of chocolate chips (I used dairy free ones), add a little vanilla and salt to taste and stick it in the fridge to re-solidify until ready to use. Then you whip it up a little and use it for whatever:) See? Nice and easy! And so yummy:) Feel free to use this on your page if you want to! This is so good! Thank you so much for sharing this. I used cayanne pepper and wowza! Loving the kick. I came here via Pinterst now I need to check out the rest of your recipe. Back again and this time I followed the recipe except for apple sauce ,used graded apple, and chill ,used cayan, simply because they were easier to get hold of. My husband who doesn’t care or remember what he’s eaten requested this brownie and my work colleague too! Just amazing how tasty and moist without being gooey the brownie is and totally guilt free with a surprise kick. Thank you again. This is AMAZING. I had been looking at these Brownie’s for some time! I read through all of the comments and having baked with most of these foods, felt confident that it would be delish! 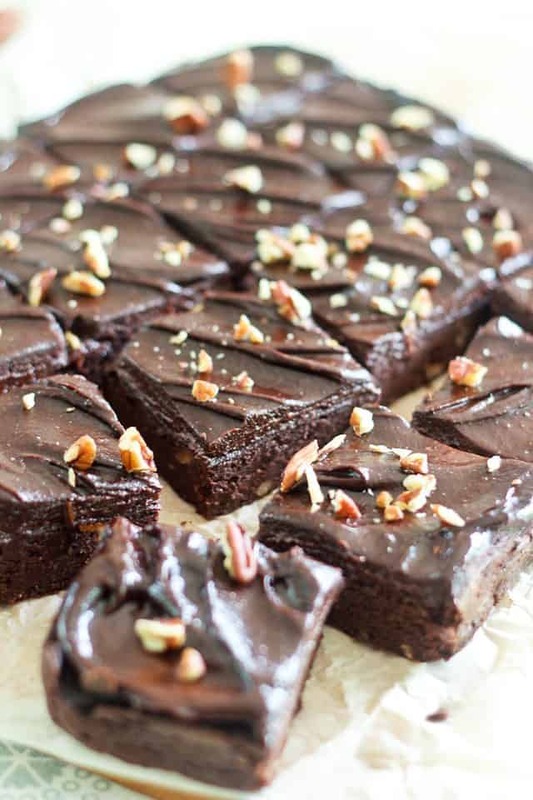 These were truly amazing, the texture was that of a brownie, the icing to die for! 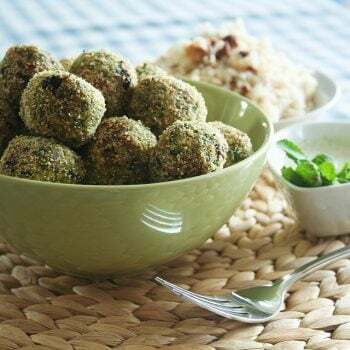 I served these up to people who aren’t into Paleo and they loved them (at the dinner party we had). My mother in law also loved them and was very upset when she came to visit and found out that it was all gone. We did resist trying the brownie as soon as it had been made ..hard as that was..waited until morning. Also tried 3 days later and still fantastic. 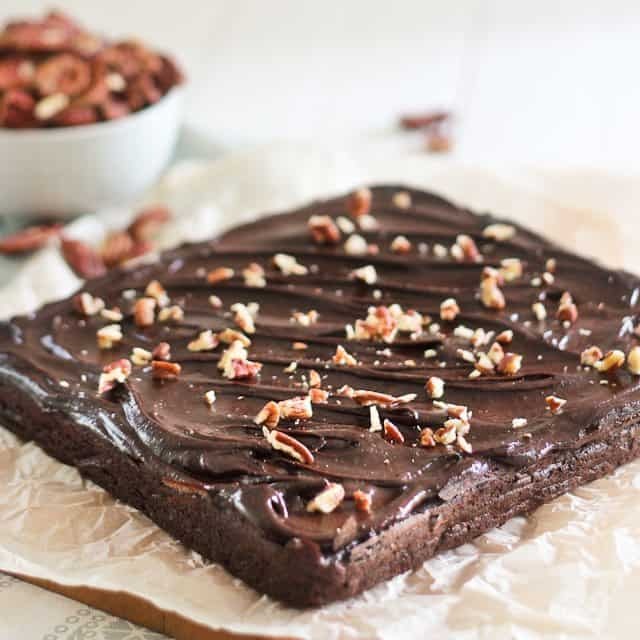 b) what in your mind are the benefits to a paleo brownie recipe? The original recipe includes spelt flour, which is basically just another form or wheat, so a definite paleo no-no. Also, it calls for as Greek yogurt and whey protein powder, which are paleo “gray zone” ingredients. Hi! 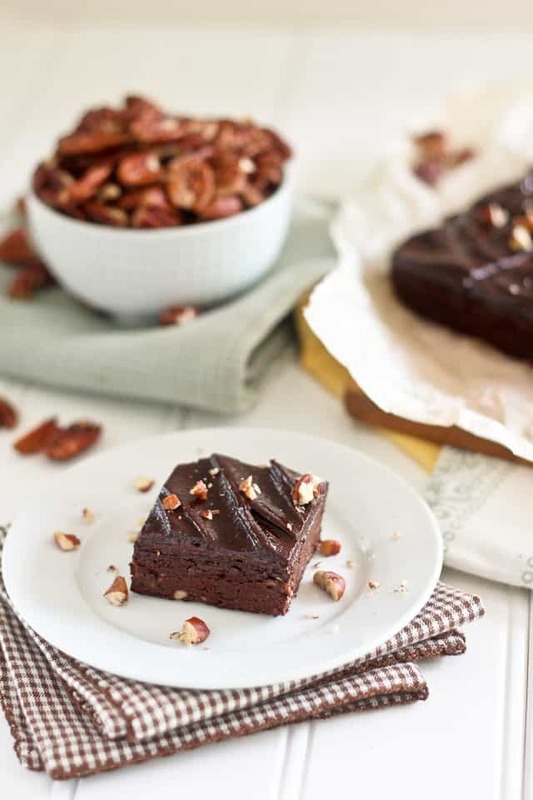 I was very excited to try this recipe – the pictures look like the finished product would be exactly what I want – a super fudgy dense dark chocolate brownie. I made the sweet potato purée and date paste from scratch with great success, purchased unsweetened applesauce, and encountered some difficulty getting my hazelnuts to become creamy (after toasting and deskinning, they got to the texture of wet sand but would absolutely not get creamy). Fortunately this did not end up affecting the texture of the frosting, which is to die for. I did wait a full 24 hours for the brownies to cool, but the actual brownie part is not at all like the photos. Definitely when they came out of the oven, I immediately noticed that it was looking rather cake-like and not fudgy at all, but was hoping the chilling time would change the texture. Any idea what could have gone wrong? I followed the recipe exactly. The texture of mine is completely off and not yummy. It’s cold in Berlin already, perfect time to bake and enjoy cozy time at home. I made the brownie last night by following your recipe faithfully. I put it int he fridge and enjoyed it for breakfast with my husband today! I love the chilli touch and that it’s dark smoky and not too sweet. So Big Thanks for sharing! Unfortunately the texture turned out to be too smooshy, not so chewy and condensed like the texture of a brownie. After the cake cooled down I wrapped it in saran wrap and put it in the fridge, only to discover this morning the cake seemed to have sweated. The surface is shining. Would it not have gotten So moist and soft had I just left it open while chilling in the fridge? Much thanks for your reply! Wrapping in Saran Wrap was a bad idea, Jing. Of course, that condensation caused the cake to get a completely different texture, like wet and smooshy… Cakes, I always cover loosely if at all when I put them in the fridge to chill. They look great. I can hardly wait to try the recipe. OYB! 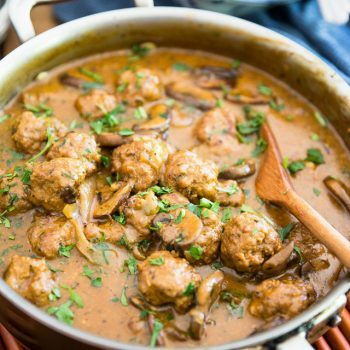 Did you happen to get this recipe from a paleo book for beginners. The measurements are exact , except it called for a 1/4c maple syrup. Really? What book is that, exactly, Annastasia? I’d be very curious to check it out! I just made these and I don’t know what I did wrong but they came out absolutely awful. I followed the recipe to the letter, but instead of the delicious looking brownies in your picture, I got something more akin to a fluffy chocolate omelette (not a souffle, not fluffy enough for that) with no sweetness whatsoever and a horrible taste that didn’t taste remotely like chocolate. Did you ever experience anything like that, or know what might have caused it? I’m really sorry to hear, Nikki! Without having been there to witness the entire process, it’s really hard for me to pinpoint what went wrong… I’m guessing your cacao powder is responsible for the flavor, though. What kind did you use? Well…this is the first time I have ever left a comment about a recipe but I just had to say thank you SO MUCH for this amazing one! I made it from scratch last night (including baking the potatoes and making the applesauce and date paste) and it was SO worth the effort! AMAZEBALLS! Perfectly not-too-sweet base and I loved the hint of heat from the chilli, balanced perfectly by the to-die-for creamy-sweet frosting! – I cooked it (not deliberately!) until a cocktail stick came out totally clean – but the final texture was still…perfect! Moist, dense and fudgy. I wonder whether the people who had an issue with the cake bit might have undercooked it? Anyway, you made me and my 8 year old son VERY happy about an hour ago! THANK YOU! “How many haters does it take to change a light bulb? None. They fear change, even if it can make the world a brighter place”. Wow, thank you so very much for taking the time to leave such AMAZING feedback, Kate! I am so thrilled to hear that you and your 8 YEAR OLD enjoyed the brownies! 😀 Now you made this (almost) 42 year old VERY HAPPY, too! I’m hoping to make these on Wednesday for some friends at the gym and myself to celebrate one of our guys wrapping up his physical therapy/rehab ahead of schedule. I made my own coconut flour earlier this week and am going to make date paste tomorrow. My question is I don’t have any hazelnuts or the funds for them on short notice. But I do have a bit bag of sunflower kernels. Would toasted sunflower butter be a good substitute here, do you think? Or would I be better off leaving them unfrosted? I’m not sure about sunflower seeds, really… almonds I think would be a better alternative, if you have access to those. But I think sunflower seeds would be a better option than leaving them unfrosted, still. I guess I’ll have to break down and get some hazelnut butter then lol :p Do you know how to make it instead of store bought? Also, I understand that peanuts are legumes and not nuts but why aren’t they a part of the Paleo diet? Wow, just Wow. I made these for a family reunion. They are so dang delicious! I’ve been wanting to go “Paleo” before “Paleo” was a thing but didn’t know how to make desserts. Which of course is my weakness. I think now I can fully embrace a new way of eating. Thank you so much for sharing! This is awesome! I didn’t have arrowroot flour, so I used almond flour, and I couldn’t find any dates for some reason, so I used raw honey, and I don’t like nuts in brownies, so I didn’t use pecans, and I didn’t have any hazelnut butter and didn’t want to buy any because it’s expensive, so I didn’t frost them, but these are fantastic even with the substitutions and without the frosting, wow. Thanks so much for sharing this!! They’re filling too; I’m eating them for breakfast for the rest of the week. these look so amazing!! how long did these take to make around about (including baking)? If you already have the leftover baked sweet potatoes, these really don’t take long at all to make. Maybe 10 minutes prep, plus 25 minutes baking time. The cooling part takes the longest, that’s for sure! I always work with fairly large avocados, so I would definitely go with the larger one. As for the sweet potato, I did use the orange fleshed variety. Hi… These sound so yummy! Thanks for sharing. I know they won’t be the same, but I don’t have some of the ingredients. Can you suggest alternatives, or can I leave out? Arrowroot flour – Can I just use other flour, even normal wheat flour? Ancho chile powder – can I leave out or substitute with anything else? Hazelnut Butter… Could I use peanut butter or something else? One other thing… to make the date paste, it says to use 450g. How many dates, or cups would that be, approximately? – Arrowroot powder acts pretty much like cornstarch, so you can sub that or tapioca flour, or perhaps even rice flour. – Ancho chile powder you can very well leave out, or sub a pinch of cayenne. – Hazelnut butter, I wouldn’t recommend using peanut butter, especially not if it’s the commercial kind, as the textures are extremely different. Best substitute would be toasted almond butter. Thank you so much for taking the time to answer all my queries! I am looking so forward to trying these out! Hi Sonia, I am so excited to make these – date paste, ripe avocado, and sweet potato puree are all ready to go. But then I remembered I have a sensitivity to apples. Any ideas on what I could sub for the apple sauce? Thanks so much! 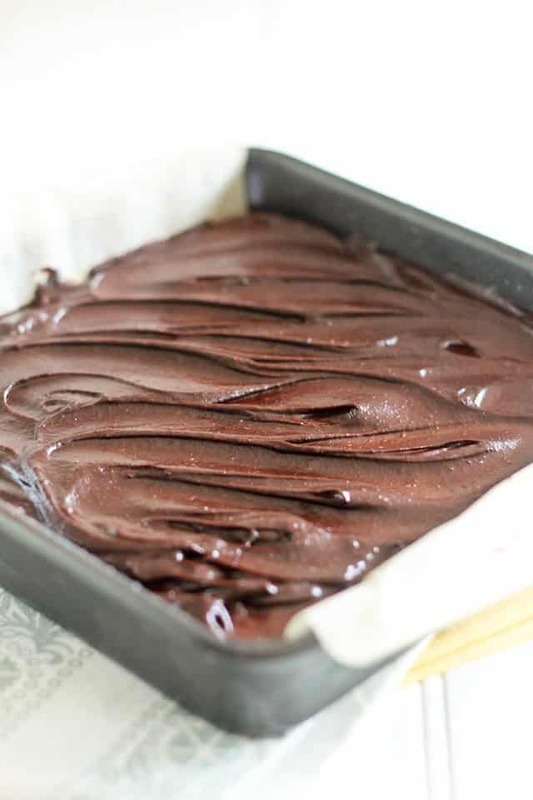 All I can think of is mashed banana, but it will definitely change the flavor some… if you’re a fan of bananas and don’t mind their presence in your brownies, then I’m guessing that would be a good solution. Otherwise, I would go with more sweet potato puree. Thank you, Sonia! I wanted to make these last night and remembered I had a pear around, so ended up using pear sauce. I only had about 1/3 c. so I added an extra t. of honey. I only had a 8×8 pan and had a little trouble with the baking (they were getting dark on the top and still mushy in the middle). As you warned, they are not very good out of the oven, but they are better today and the frosting is delicious. They have a bit of a cakey, eggy texture to them. Do you think this is because of the pear sauce / pan or are they supposed to be like this? They also don’t quite look like yours so I’m guessing something was off with my batch. Anyway, thank you again!! Looking forward to trying another of your recipes soon. I’m assuming these will keep in the fridge for 4 days or so based on your comment… if not, let me know please! Ps the date paste no longer looks like peanut butter, after just about an hour the color definitely got much darker (like yours)! YAY! I’m thrilled to hear that the brownies are to your liking, even though they weren’t quite sweet enough. Doubling the icing sounds like a good idea… one can never have too much icing, can they? 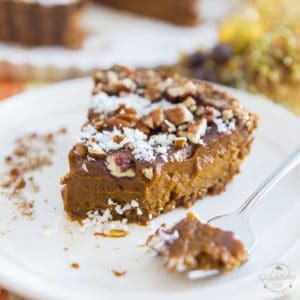 Can this recipe be made without the arrow root? Thanks! You could replace it with tapioca starch or even corn starch, if you’re not adamant on keeping the brownies paleo. If you didn’t have ancho chili powder, would you simply omit it or use “regular” chili powder? These look awesome – can’t wait to try them!! You could very well just omit it, Cindy. Another question: Has anyone used whole dates in this recipe and just processed a long time to get a smooth batter? I don’t have date paste and I’m dying to make these, but I don’t have time (or patience!) to make date paste too!